Former White House Press Secretary Sean Spicer was on hand at Madame Tussauds in New York on Wednesday to help unveil the museum's newest addition — a wax figure of first lady Melania Trump. The wax Melania Trump is part of a larger installation titled 'Give Melania A Voice,' which will give visitors the opportunity to publish tweets on behalf of Melania on the museum's @MTMelaniaMoments Twitter page beginning on Thursday and lasting until May 31, 2018. Spicer deemed the wax first lady very life like. "I'm not kidding, I looked at a photo I had with the first lady before I left and I mean — it's pretty remarkable how lifelike it is, and the same thing with the president. It's impressive," Spicer said. "She's a very gracious and fashionable woman," he added. "I don't think the American people have fully appreciated the level of intellect she has and her political savviness." 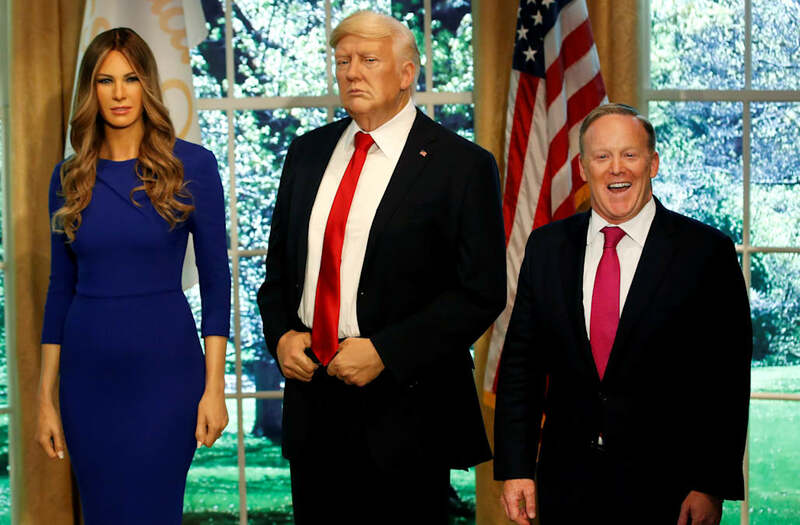 Spicer would comment on whether he thought Melania's wax figure — clothed in a royal blue dress — was more or less lifelike in comparison to her husband's figure, but he noted that her likeness was highly accurate. Trump's wax figure was put in place in January 2017. Madame Tussauds said it receives permission from subjects before creating the figures.